The Social Studies Lab: Stanford History Education Group: Making Primary Sources Fun! 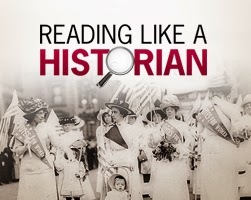 Furthermore, SHEG is a strong proponent of "Reading Like A Historian," which "engages students in historical inquiry...Each lesson evolves around a central historical question and features sets of primary documents designed for groups of students with diverse reading skills and abilities" (http://sheg.stanford.edu/rlh). Establish relevant background knowledge and pose the central historical question (ie. PowerPoint presentation, video, reading the text, lecture). Students read documents, answer guiding questions or complete a graphic organizer (ie. comparing the text to a historical document, cognitive apprenticeship modeled by the teacher, historical inquiry, and Structured Academic Controversy debates (SAC)). Whole-class discussion about a central historical question. The lessons and activities provide a strong foundation for social studies educators looking to evolve beyond the traditional selected response assessments. Even supply formats, such as essays, can be poor assessments if their objective is too narrow in scope. Moreover, the SHEG lesson plans are easily modified to cater to the needs of any type of learner. I myself have used a SHEG lesson plan on the Palmer Raids (see lesson plan above) to instruct a class of English Language Learners. The only real modification that I needed to make to the lesson plan was editing the length of the primary source documents and the lexile level. The supplemental worksheet was not affected and the students became excited at the challenge of analyzing primary sources to make inferences (they were becoming quite bored with the constant barrage of structural language acquisition). Overall, the SHEG website is an extremely valuable resource for any social studies educator who yearns to make a lasting impact on their students' lives. It allows the teachers and students to move beyond the textbook to address issues from the perspective of the people who lived through these events. The lesson plans are well researched and meticulously planned. I have even used the knowledge gained from the SHEG website to begin to create my own DBQs. Hopefully, the future of social studies education lies not in the retention of factual data but in acquiring the necessary skills to not only be successful students, but well adjusted citizens. 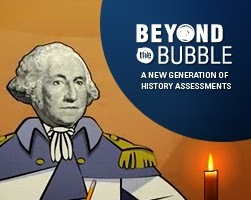 Check out the videos below that detail SHEG's Beyond the Bubble assessments and their Reading Like a Historian lessons.